If the Left is serious about wielding and transforming state power, it needs to go beyond a moralistic understanding of corruption. The fight against corruption has become a defining theme of contemporary politics. Everyone from the World Bank to Donald Trump insists on the need to clean up the swamp and oust wrongdoer officials. Yet from the soft coup that removed former Brazilian president Dilma Rousseff to Filipino strongman Rodrigo Duterte’s murderous campaign against supposed criminals, “anticorruption” can take on sharply reactionary hues. The Left has struggled to offer a coherent response to this problem, particularly when anticorruption politics are mobilized against progressive governments. It has often dismissed corruption as a mere outward expression of capitalism that does not need addressing on its own terms; treated allegations of wrongdoing as nothing but a right-wing smear campaign; or even worse, opportunistically tagged along with the Right’s own anticorruption rhetoric. Yet if the Left is serious about wielding and transforming state power, it needs to go beyond a moralistic understanding of this question. No one could reasonably advocate “for” corruption. Yet it is only by properly understanding the sources of this ill and the reasons for its ongoing relevance that we can address it as a political problem. Corruption tends to thrive amid a culture of impunity and a low degree of development. In the modern era, the remnants of pre-capitalist oligarchies perpetuating personalized sources of power are a major source of corruption in the relations between state and capital. But this tendency is reinforced wherever mass movements are not powerful enough to hold elites accountable. Precisely for this reason, corruption is not the inevitable fate of impoverished or sinful nations, but a product of specific historical forces and class struggles. In fact, the very notion of corruption has changed over time. This category has been central to political thought and practice for millennia, occupying a central place in works from Niccolò Machiavelli’s Discourses On Levy to Alfred Hirschman’s The Passions and The Interests. Classical political theory saw corruption as a preordained process that causes institutions to degenerate unless something intervenes to bring about their renewal. In the republican philosophical tradition, corruption enfeebled the moral health of society as a whole; the fight against it thus required a return to “civic virtue” through a common political project. Corruption sparks a cycle of diminishing expectations, producing apathy and political demoralization. This differs from the definition of corruption today used in the anticorruption policy promoted by international institutions such as the World Bank, which instead defines it as “behavior(s) that break with the rules governing public officials regarding the pursuit of private interests, such as wealth, power or status.” This curiously overlooks the non-state actors which are usually involved in such corrupt exchanges — the corrupt businessman trying to influence a policymaker through a bribe is let off the hook, as he is reduced to a merely passive role. But this shift in the definitions of corruption reflects a broader move from understanding politics as a sphere of passions and civic virtue to one that sees it as no more than a terrain of competing interests. In truth, corruption is more than simply a set of illicit exchanges. Rather, it is a political strategy that specific interests use to capture or influence institutions or the state. It is, in essence, the privatization of public life. To see this, we need only look at the recent example of the Guptas, an Indian business clan who were able to capture the South African state. With the aid of former president Jacob Zuma (who they had bought off), the Guptas were able to direct cabinet appointments, state procurement strategy and budgets in order to channel public funds into their private coffers. Indeed, private actors don’t merely suffer from corruption — they actively generate it. This ranges from businessmen bribing politicians to vote for deregulation to possibly non-illegal activities such as the revolving door between the private sector and politics. Private actors can corrupt institutions over time to the point where unwritten codes and practices incentivize public officials to engage in or turn a blind eye to corrupt exchanges. When this becomes “business as usual,” we can say an institution has been corrupted. At the same time, practices referred to by their opponents in the language of “corruption” can at times play a redistributive role, for instance when patronage is exchanged for votes in the form of infrastructure, state spending, or public housing. This summed up by the famous Brazilian expression, “rouba mas faz” (he robs, but he gets things done). If one is forced to choose between a neoliberal politician who might not be corrupt, but will slash social spending, or a corrupt demagogue who makes sure his community gets something back, can we really say the former is better? This, however, carries its own dangers. Systemic corruption does more than just affect the functioning of institutions. It sparks a cycle of diminishing expectations, producing apathy and political demoralization. If individuals see a political party or movement as “corrupted” and thus unable to effect meaningful change, this cynicism will often lead them to turn back to their own private interests, or at best see politics in purely transactional terms. If political change is impossible, what else is there but to look after your family and your own personal wellbeing? Such cynicism is toxic. And systemic corruption will, in any case, make it easier for a public official to justify corrupt exchanges as themselves part of normal politics; bribes are transformed into “gifts” and “favors” and illicit transactions become expressions of “friendship” and “solidarity” rather than self-interest. Such is this vicious cycle that today the World Bank decries corruption as the single greatest obstacle to global development. As a result, anticorruption policy has become a standard feature of post–Cold War development projects, institutionalized as a feature of the neoliberal world order. Yet in fact, corruption was not always seen as an impediment to development. Indeed, the shift from corruption being viewed as a domestic issue to it appearing as an international concern is a particular feature of the post–Cold War era. During the heyday of modernization theory in the 1950s and 1960s, key development theorists such as Samuel Huntington argued that corruption was actually conducive to development, as it could cut red tape and allow markets to operate more smoothly, thus making it easier for multinational corporations to do business. Corruption did not stand outside of the modernization process; rather, it was seen as its inevitable product. As much of the Third World entered the debt crisis of the 1980s and 1990s, in large part as a consequence of being compelled to follow the neoliberal policies set by the World Bank and International Monetary Fund as a condition for loans, the West invoked “corruption” in order to excuse itself of blame for the misery, poverty, and suffering it had inflicted across the world. In this portrayal, impoverished nations’ failure to modernize was not the fault of technocratic experts introducing structural adjustment policies, but these countries’ own endemic corruption, too backwards to adhere international standards. The (real or asserted) failings of Eastern Bloc socialism and of social democracy were also explained in terms of corruption. In the 1990s, as liberal ideologues rushed to proclaim that socialism had been proven unviable, they insisted that all collectivist projects were doomed to fail because of individual greed and the rational pursuit of self-interest, which inevitably corrupted these systems. In this argument, these energies could only be controlled and put to use through the free market. After the collapse of the Soviet Union, corruption came to be seen as the essential obstacle to Third World development. By 1993 anticorruption had been adopted as a key component of international development policy by the World Bank, IMF, and United Nations. Anticorruption policy became centered on something called transparency — meaning, adherence to standards that suit the interests of international capital. Transnational corporations and finance capital’s ease of moving money freely and doing business became the lynchpins of policing corruption. In fact, this meant little but a fight to increase the autonomy of local bureaucracies from their populace by walling them off from the “corrupting” influence of mass politics, instead making them more dependent on the international institutions that kept watch over them. Technocratic anticorruption politics aim to transfer power from the electorate to responsible elites. It set international standards on what counts as corruption, often in line with opening up countries to international capital. State intervention in the economy, redistributive reforms, and welfare states are portrayed as either vulnerable to being captured by corrupt interests or sometimes as a form of corruption unto themselves (particularly for libertarians who regard all taxation as theft). Here, we need only think of the ritual condemnations of bloated bureaucracies and red tape. Populist anticorruption emerges in response to political systems widely perceived as stuck in the mire of corruption that stains every politician and political party regardless of their ideology. A charismatic outsider untainted by the stain of the establishment appears promising to sweep the system clean purging the corrupt elite that dominate the country, as he — for it is invariably a he — offers a messianic politics of redemption. The West invokes corruption to excuse itself of blame for the misery, poverty, and suffering it has inflicted across the world. Anticorruption plays a central role in anti-politics: the sentiment that politics is no longer a vehicle for meaningful change. Any attempt to exert change through politics will inevitably fall prey to corruption, the entire system is corrupt and only somebody or something outside of the system will be able to exert meaningful change. Only a party, leader, or movement outside the system — meaning outside “politics” — will be able to exert change, such as a military officers or a successful entrepreneur. Widespread rejection of politics or the system doesn’t open the way for a Bolshevik style seizure of power by revolutionary socialists; instead it leads to the rise of charismatic authoritarian outsider politicians promising to do away with corruption like Rodrigo Duterte in the Philippines or far-right leader Jair Bolsonaro in Brazil. Populist anticorruption, while not necessarily always conservative-leaning, tends to favor reactionary forces. This is especially true in the contemporary context of a widespread loss of legitimacy for mainstream center-left or social-democratic parties. Right-wing anti-corruption populism, like the National Front in France or the Lega in Italy, has come to fill the void left by the collapse of the center-left. Anticorruption populism is form of moralism cloaked in the veil of anti-politics; the solution is just to kick the bad guys out of office. Corruption tends to be individualized and personified as some aloof elite or center-left politician becomes the symbol of all that is corrupt and wrong. This works especially if it is plausible (as in the case of Hilary Clinton) but can also function in terms of class hatred, sexism, racism and anti-poor sentiment in the case of Dilma Rousseff in Brazil. Anticorruption individualizes politics while ignoring the structural incentives that produce systemic corruption; ironically, this empowers corrupt self-serving leaders like Donald Trump or Silvio Berlusconi. Populist anticorruption politics and technocracy share similar antidemocratic impulses. Anticorruption populism tends to dismiss democratic political systems as corrupt, portraying rights or due process as things that just get in the way of fighting corruption. Just shoot the bastards, lock ‘em all up and other forms of grandstanding are common features of this rhetoric. Technocratic anticorruption politics sees popular mobilization and ideological debate over policy as illegitimate and thus corrupting. This movement in fact combines both the technocratic and populist forms of anticorruption politics. Even beyond the antidemocratic impulses that unite these two approaches, we also find that they share one same millenarian core in which the redemptive force of technology or leadership can eliminate the stain of corruption and redeem the country concerned. Ironically, by removing politics from the checks and balances of democratic accountability, technocratic anticorruption politics leads to exactly the disillusionment with politics that helps corruption thrive. It insulates corrupt officials from having to account to the masses and leaves corruption policy in the hands of the private sector, which often has no interest in fighting corruption. Anticorruption populism turns political struggle into a simple moralism, often delegitimizing mass struggle as a vehicle for meaningful change. In order to more concretely illustrate the failings of anticorruption politics it is worth contemplating the specific example of its effects in Brazil. Here, mass anti-corruption protests against Dilma Rousseff and her Workers Party (PT) government in 2015 helped usher in a soft “parliamentary” coup that has set back social rights decades. 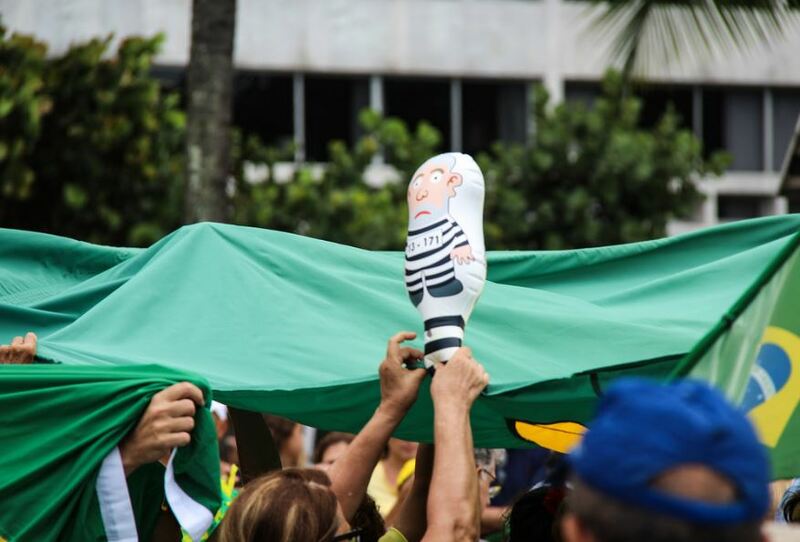 The protests followed the historic Lava Jato (car wash) corruption investigation that has led to the imprisonment of former president Lula da Silva on flimsy evidence and implicated virtually the entirety of Brazil’s political class. Yet their real target lay elsewhere. Backed by Brazil’s corporate media, dominated by Rede Globo, Lava Jato was turned into a national event with headlines everyday focusing on the prosecutions and investigations into leading members of the PT. The central protagonist in Lava Jato, Judge Sergio Moro, was turned into a messianic international anticorruption superstar. Following calls in the media, hundreds of mostly middle-class Brazilians took to the streets in protest against corruption. Crucially, it was the upper-middle class that led these protests, even if the protests included sections of the working class and even organized labor. The protects were backed by shadowy anticorruption movements like the Movement for Brazilian Liberty (MBL), funded by the Koch brothers and the dark web of libertarian money and international right-wing parties. Anticorruption thus became a rallying cry for the PT’s enemies. But what was notable was that it was used as a catchall phrase for hostility to the party’s social policies. While it did not break with neoliberalism, the PT’s time in power had seen historic social measures such as raising the minimum wage, welfare grants, and elite universities introducing quotas that allowed poorer students to attend. Even these quite moderate social policies were interpreted as upsetting the natural order — an alleged “meritocracy” — by lifting up the supposedly undeserving poor. Right-wing media thus cast social security as “bribes” to the poor and working class. Neo-developmentalist attempts to stimulate Brazil’s ailing manufacturing sector, promoting certain sectors of capital — in particular the construction industry and state-owned enterprises — were particularly targeted by anticorruption activists. Lava Jato paralyzed these efforts and with the help of opposition parties prevented the PT from responding to economic crisis. Lava Jato was used to cast state intervention in the economy as itself being a form of corruption. We must fight corruption not simply by boasting of our higher morality, but through the struggle to expand the reach of democracy itself. The effect was to criminalize moderate social democracy and the Left through the rhetoric of anticorruption. Post-coup president Michel Temer — who enjoys the lowest approval rating in recorded history — and his government have been tainted by corruption scandals. But while he is heavily implicated in Lava Jato, he has not faced prosecution. Anticorruption protests targeted only the PT, while the Temer government’s naked criminality meets with indifference from the very same forces that demanded Dilma’s head. Issuing a call for the people to rally against a corrupt elite is a standard feature of Leftist political rhetoric; it for instance, it played a key role in Andrés Manuel López Obrador’s historic election victory in Mexico. However, this type of politics often sows the seeds of its own downfall. A center-left or socialist government coming to power on anticorruption platform will surely risk demoralization and demobilization if it itself falls prey to scandals. For this reason, the Left has to move beyond an easy, moralistic anticorruption rhetoric, especially if we are serious about taking power. The Left faces the particular challenge of convincing ordinary people not only that the existing order is undesirable but that it can be substantially transformed through collective action, in a struggle that will surely itself demand sacrifices. The Right has the much lesser burden, in this regard, because all it usually has to do is persuade people to stay home and pursue their own private interests. Corruption and anticorruption movements pose a significant danger to the Left because they each reorient politics onto this terrain, while also feeding a wider cynicism that politics can ever be more than a terrain of self-seeking. Taking power necessarily requires a degree of compromise; some elements of a political project will be absorbed by the state, and anyone governing institutions that are run according to their own unwritten codes will have to depend on the exchange of favors or influence. Often, as in the case of Syriza in Greece, a left-wing government is dependent on unsavory coalition partners. This results in key cadres and intellectuals being absorbed by a bureaucracy that incentivizes not just negotiation but horse-trading. At the same time opportunists will invariably flock to a successful party seeking to advance their own careers, even though lacking its core principles. Corruption thus presents a particular challenge for that Left which is concerned with taking power. It is all too easy for a Left concentrated on maintaining its own purity in permanent opposition to embrace a moralistic cynicism about those in power, without reflecting on the rebound effect this may have on belief in political change itself. Formulaic accounts of leaders betraying the workers’ struggle or the revolution are often not all that different from myopic conservative narratives about the corrupting effects of power on projects that aim to use the state for progressive ends. A left-wing anticorruption politics must, therefore, accomplish two central tasks. Firstly, it needs to politicize corruption in way that is neither moralistic nor technocratic. Secondly it has to focus on reducing the sources of systemic corruption — elite power and inequality. The source of systemic corruption can only be combated through political struggles to achieve meaningful reforms in conjunction with egalitarian social policies. If the Left in office is to avoid being co-opted by the state’s own corrupting mechanisms, it needs to begin constructing an institutional legacy that future left governments can build upon. This requires meaningful political reform and measures to weaken its enemies’ power within the state machine. But imposing such change, which is perhaps the greatest challenge a left-wing anticorruption politics has to face, also relies on building democratic control through mass mobilization. We must fight corruption not simply by boasting of our higher morality, but through the struggle to expand the reach of democracy itself.